Is the X-Men's Colossus' skin really 'organic steel' or something… else? – AiPT! Is the X-Men's Colossus' skin really 'organic steel' or something... else? Could Colossus’ skin be something even more exotic, yet real? Since their debut in 1963, the X-Men have sworn to protect a world that hates and fears them, but here at AiPT! we’ve got nothing but love for Marvel’s mighty mutants! To celebrate the long-awaited return of Uncanny X-Men, AiPT! brings you UNCANNY X-MONTH: 30 days of original X-Men content. Hope you survive the experience… AiPT! Science is going all-in for Uncanny X-Month, with the most detailed look at X-Men biology anywhere, EVER. Today materials scientist and science communicator Barry W. Fitzgerald examines Colossus’ skin and asks, “organic steel,” or something else? The X-Men possess a diverse range of powers, thanks largely to the differing ways that the X-Gene, the famous mutant genetic factor, has modified their individual genomes. Many people would name the accelerated healing factor of Wolverine or Deadpool as their mutant power of choice, or declare that Storm’s ability to control the weather is the only mutant power that counts. These powers are all impressive in their own right, but none of those characters are impenetrable. Despite his accelerated healing, Wolverine’s skin can be damaged in the same way anyone else’s can. Thanks to his mutation, Colossus can create an impenetrable, silver-colored layer around himself that offers increased protection for his skin, bones, and organs. Colossus has been an often-underappreciated member of the X-Men, but thanks to his prominent role in the Deadpool films, the spotlight is now very much on this ethically and morally responsible superhero. His impenetrable skin might look like some sort of steel alloy, but science would argue otherwise. Piotr Rasputin was created by Len Wein and David Cockrum, first appearing in Giant-Size X-Men #1 in 1975. Originating from Siberia, Colossus was afforded a truly unique power — the ability to change his external appearance so that his body would be covered in an impenetrable “organic steel” shell. When Colossus expresses his power, the structure of his skin, or part of his skin, changes in some way. However, a key question is, “How much of his skin actually changes into steel when he uses his power?” To answer this, the structure of human skin needs consideration. Biologically speaking, our skin is quite impressive. It is the largest organ in the human body and does a number of important jobs. It stops water, bacteria, and viruses from entering our body and causing nasty health issues. Skin is also important for maintaining the internal temperature of the body, a process known as thermoregulation. And, of course, it keeps our bones, blood, and organs inside, stopping them from falling out! There are some very important layers in human skin. The top layer of human skin is known as the epidermis, and has a thickness of about 60 μm (micrometers), which is roughly the thickness of a human hair. Below the epidermis is the dermis, which contains blood vessels, sweat glands, nerves, and hair follicles. Below the dermis lies the hypodermis, which connects the skin layers above to the bone and muscle below, otherwise the skin would not stay in place! When Colossus changes into his impenetrable “organic steel” skin, it’s most likely that just the outermost epidermis and dermis layers change, which together have a combined thickness of about 2 mm. That might not seem like much, but there’s another issue of greater concern. 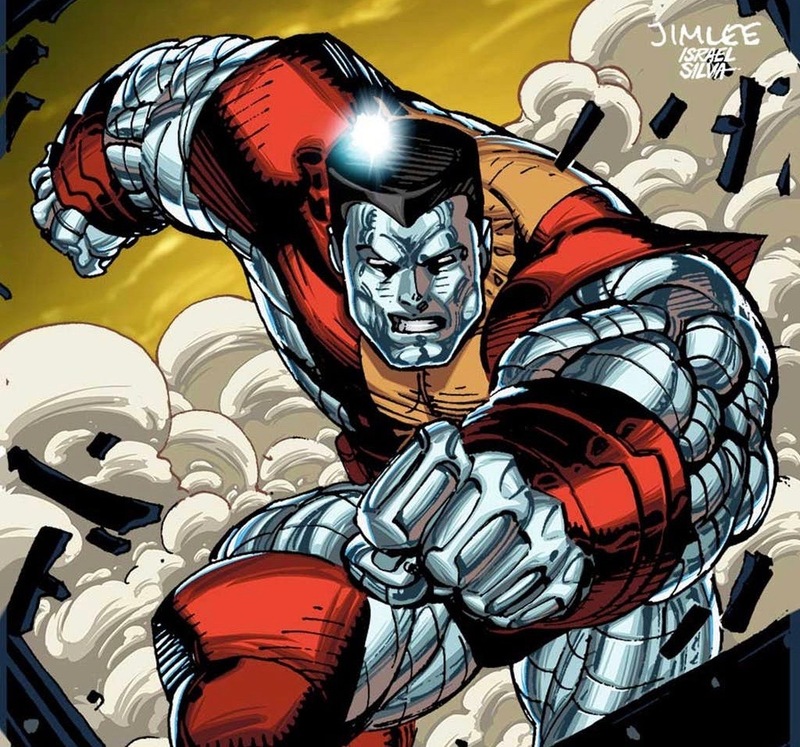 It’s quite impossible that Colossus’ skin is actually made from steel. Steel is an alloy, with iron being the main element in any steel alloy. Approximately 96% of the human body is made of carbon, hydrogen, oxygen, and nitrogen, but 0.00006% (or 0.005 kg of the human body) is made of iron, and when Colossus changes into his mutant form, his mass can increase by 25 kg or more. Clearly, that’s a big difference, and something has to give. Colossus’ body does contain lots of carbon, which can be found in an incredible material that could be the real material behind his impenetrable skin. That material is graphene. Graphene gets much of its strength from its crystalline structure. Graphene’s unique properties make it the subject of lots of scientific research around the world. It’s stronger than diamonds, more conductive than copper, and capable of supporting very large loads, all from a material just one carbon atom thick (less than a billionth of a meter) and made of a series of carbon atoms arranged in a regular honeycomb lattice. This extraordinary material has been used to make advanced transistors, in wound-healing treatments, and new bio-inspired materials. In terms of impenetrability as a superpower, graphene as a source is quite logical. In one scientific study, it was shown that layers of graphene offer better protection than steel alloys or Kevlar, the material normally used in bulletproof vests, when micro-bullets traveling at close to 1 km/s were fired at it. This protective capability seems to be on a par with what was shown in Colossus’ battles with Angel Dust and Juggernaut in the recent Deadpool films. The process by which Colossus might make a bio-graphene protective outer layer would involve many stages such as protein folding, protein self-assembly, and the transfer of the bio-graphene layer to the outer layer or epidermis of his skin, but Colossus’ skin being graphene would solve biological problems that “organic steel” would certainly cause. Steel would actually make it harder for Colossus to regulate his core temperature via sweating and evaporation. On the other hand, graphene layers or membranes are known to allow water to move through them. Of even greater significance for Colossus is that graphene could also retain electrolytes that are important for the body during exercise, or when battling Magneto’s Brotherhood of Mutants! When in his mutant form, Colossus’ body is completely covered, including his eyes. If his skin were made of steel, then it would affect his ability to see. Graphene is transparent and would not affect Colossus’ eyesight, but it would lead to a change in his appearance, in that he’d no longer have his distinctive silver-colored exterior. Research has shown, however, that the color of graphene can depend on the type of material beneath it. If the layer below his graphene skin contains silicon oxide, then there’s a chance his skin could still appear to be silver. Because, let’s be honest, Colossus is really cool with that silver look. Regardless, a viable alternative for his skin would be one that is made from graphene, thanks to the carbon content of his body. Graphene offers greater protection for Colossus and ensures that his body continues to function normally. As a member of the X-Men, Colossus uses his mutant powers for good and with graphene, he can continue to fight the good fight. Further details on the possibility of Colossus’ skin being made from graphene can be found in Barry Fitzgerald’s paper “The physiology of impenetrable skin: Colossus of the X-Men,” which is published in the journal Advances in Physiology Education.